Mass spectrometry (MS) based proteomics has become an essential tool for biologists over the last decade. The ability of a mass spectrometer to identify thousands of proteins from a complex biological sample has revolutionised scientific experiments. To fully understand the function of the proteome in health and disease, however, one must have the ability to accurately quantify proteins in many different types of biological samples. The invention of faster and higher resolution mass spectrometers has enabled the quantification of complex proteome dynamics. Heavy stable isotopes are routinely employed to generate precise and accurate quantitative proteomic data. Peptides labeled with heavy stable isotopes share identical biochemical characteristics to “light” or unlabeled peptides except a difference in mass. Mixing heavy peptides with light peptides results in peptide pairs that co-elute into the mass spectrometer, which can easily distinguish between the peptides based on the mass difference. Quantifying differences between proteomes subjected to different biological conditions or experiments can be achieved when using the heavy peptides as an internal standard or a control. CIL offers a variety of stable isotope reagents for labeling any proteome for quantitative MS analysis. These stable isotope MS methods are bringing scientists closer to curing human diseases through quantitative biomarker analysis and quantitative proteomic analysis of animal models of disease. 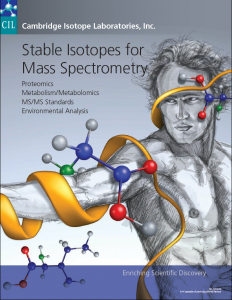 All proteomics products can be found in our online catalogue or alternatively they can also be found in our Stable Isotopes for Mass Spectrometry catalogue. Specific product area pages are listed below and provide additional information and resources for each area. If you have any questions or would like to discuss any element of your proteomics work then please don’t hesitate to contact us. SILAM is a labeling method that employs heavy amino acids or 15N to metabolically label rodent tissues in vivo. Synthesised peptides with or without heavy stable isotopes are invaluable for targeted single reaction monitoring (SRM) assays and absolute MS quantitation. CIL offers amino acids and resin for synthesising peptides in your laboratory. Chemical tagging refers to labeling proteins or peptides in vitro. This inexpensive method is advantageous over metabolic labeling due to its ability to label human samples and its low cost. In addition, chemical tagging can quantify more than two samples in one MS experiment. One of the simplest methods of labeling peptides in vitro is the incorporation of 18O during proteolytic digestion. Expression of large amounts of unlabeled and labeled proteins in heterologous systems is an invaluable tool with numerous biological applications. CIL offers a variety of media for protein expression and kits for in vitro translation.